Since the Fulltone OCD is one of our best sellers, we are going to start off our pedal reviews with it, and since one of the most common questions we get here at Humbucker Music is how the Fulltone OCD compares to the Fulldrive 2, we’re going to hit upon that as well. 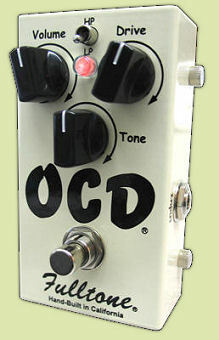 To begin with, the OCD is different than most overdrive pedals in its dynamic qualities. It’s easy to find that setting that allows you to play softly and maintain a non-overdriven sound (assuming your amp is set to clean), and then get that warm, punchy, overdriven sound when you bite in to the strings. The rich sound of this pedal can achieve the chime of a nice class-A amp or you can run it very hard to achieve thick, almost distorted sounds, with all of the ringing overtones (a.k.a. harmonics). This pedal works great in front of master volume amps as well, driving them harder than most overdrive pedals. I use mine in front of a Vox AC30 (soon to be a Dr. Z Maz) and love every sound. The OCD is one of those pedals that’s hard to get a bad sound out of. Features of the OCD include a drive knob, volume knob, tone knob, and an HP/LP switch. The drive knob controls the drive of the pedal, turning it clockwise for those warm, meaty overdriven tones; keeping it at lower settings will give you a cleaner sound or more subtle overdriven sounds. The volume knob controls the amount of signal coming from the pedal. The HP/LP switch is a feature not found on other overdrive pedals, essentially giving you 2 pedals in one. HP gives you more bottom end, increased overdriven sounds, more volume, and just a noticeable amount of upper mids (think Vox and Marshall). LP will give you all the accuracy to the original sound of your guitar and amp you could want, almost no coloration. Great for boosting clean sounds and finding tones different than those British amps (think Fender,Blackface or Tweed-style). The pedal also has true bypass switching, so you lose no tone having this pedal in your chain of effects. Considering the small structure of the pedal, real estate on a pedal board is not a problem either..
We do get a lot of questions about the differences between the OCD and the Fulldrive II and I will attempt to go over those differences. To me, there is not really a better or worse between the two it’s more of a preference issue. You can definitely achieve sounds of each pedal from the other, but there are noticeable differences. The Fulldrive is great at maintaining your original amp sound, very transparent. While being transparent, it does enhance the gain and sustain of your amp, while I have to reiterate that it does maintain your original sound. The OCD is a much punchier and warmer sounding overdrive. The sounds are thicker and the overtones are richer, while the FDII is more versatile in it’s array of sounds, with the three optional settings via toggle switch as well as a built in boost. You can actually get some really great sounds engaging each pedal together. Violin like sustain and beefy sounds to chunk through chord progressions, as well as a number of sounds in between, giving you the option to really experiment with new sounds of your own. Both pedals are great, some players, including me, found the best way to pick was to get both.